A year after launching a devastating exposé of the treatment of animals in circuses in South America, Animal Defenders International (ADI) stands on the brink of securing legislation to end this shocking abuse in Peru and Bolivia. At Congress on Tuesday 6th May, new legislation to end the suffering of animals in circuses in Peru will be unveiled by Congressman Mr. José Antonio Urquizo Maggia of the Union for Peru party and Congressman Mr. Alejandro Arturo Rebaza Martell of the Peruvian APRISTA Party. The unique cross party collaboration followed the launch of of the ADI video ‘Stop Circus Suffering’, which revealed the abuse of circus animals in Peru, Colombia, Bolivia and Ecuador. ADI will also be launching on Tuesday a new report called ‘Animals in Circuses” The Science on Suffering’ that reviews the scientific evidence of suffering of animals during captivity and transport; it discusses the effects of stress and suffering on the animals’ hormones, and the psychological damage caused by the circus environment. This also features previously unreleased photographs from inside circuses in the region. Following ADI campaigns moves to ban animals in circuses is currently being considered in Bolivia, Peru and the United Kingdom. She added: “Our Field Officers who investigated the abuse of animals in circuses in Peru, Bolivia, Colombia, and Ecuador uncovered some of the most sickening violence we have witnessed: Horses and ponies beaten; a chimpanzee beaten with a chain and punched; dogs hit with metal bars to train them; and other animals whipped, punched and kicked. We hope that this week in Peru signals the end to this suffering." Scientific evidence on how animals suffer in captivity and transport, and how life in the circuses causes these animals to go out of their minds – they get “circus madness". Abuse and violence to animals is commonplace in circuses. Human rights and animal protection can move forward together – circuses without animals increase employment opportunities – and protect the public from dangerous animals (last year a lion an escaped from a circus in Lima). ADI are also urging the Government, sponsors and the public to block a visit to Peru later this month by the Fercos Brothers – a Las Vegas-style magic act featuring lions, tigers and panthers. Jan Creamer: “Like circuses, these are wild animals being kept in impoverished and unnatural environments purely to entertain people. Often the animals will have to be put into tiny cages and restrained in order to appear, as if by “magic”. Animals like tigers are naturally shy and solitary, a noisy theatre is mental torture for these animals. Anyone who says otherwise is either deluding themselves, or attempting to delude their audience. Almost all the animal acts in Las Vegas have been replaced by human shows, don’t let them start coming here because they have been kicked out in America." The launch in Lima will also be addressed by ADI South America Representative Congressmen Mr. José Antonio Urquizo Maggia and Mr. Alejandro Arturo Rebaza Martell, and ADI South America Campaigns Co-ordinator Juan Pablo Olmos from the ADI Bogota office. 1.Jan Creamer is Chief Executive and founder of Animals Defenders International. Later this week she will be travelling to Colombia where the groups are running a Stop Circus Suffering Campaign and where ADI are pressing the Government to seize an abused chimpanzee Karla. 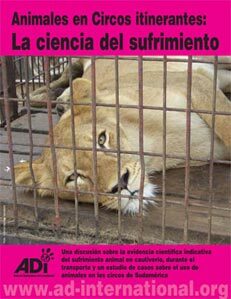 2.The ADI Stop Circus Suffering Peru campaign was launched in July 2007, the campaign has the support of Peruvian NGOs Acción Por Derechos de los Animales (APDA), Animazul, Grupo Caridad, Quimiranka, Animanaturalis and Unidos por los Animales UPA. 3.In Peru, ADI Field Officers monitored seven circuses, Circo Zafari Kids, Africa de Fieras / Circo Africa (which tours under either name), Circus Las Galaxias, Circo Do Brasil, Circo Moscow / Circo Nikita (which tours under either name), Circo Chola Jacinta, Circo Russell, as well as the animal show at the Serpentario in Iquitos. 4.Immediately after the campaign launch four municipalities of Lima – San Miguel, Villa El Salvador, Commas and El Agustino – banned animal circuses. In August, 2007, the Municipal Council of Magdalena del Mar unanimously approved an Ordinance that prohibits circuses with animals with penalties of a $550 fine and closure of the circus. 5.Kiara a lioness that escaped from a circus in Lima in July 2007 was captured by the Ecological Police for INRENA (the National Institute of Natural Resources). She had scars on her body and face, she was malnourished and her front claws had been removed – removing her claws like this is like cutting off a person’s fingers. ADI offered to take the lioness, but the lack of current legal protection in Peru meant that she had to be returned to the circus – the new Bill hopes to resolves this. 6. In July 2007, two very old lions were delivered to INRENA by the Circo Africa de Fieras in Lima, Peru, undernourished and in extremely poor health. A sad scene, graphically highlighting the plight of circus animals. The animals were euthanised after an examination revealed anaemia, emaciation, dermatitis, inflamed kidneys and pancreas, and decaying teeth. Our studies have shown us that life for animals in circuses is one of deprivation and cruelty, where they are deprived of everything that makes their life enjoyable or fulfilling – they are taken away from their families, forced to do tricks that they do not want to do; forced to live in tiny, barren cages where they have to eat, sleep, and defecate all in the same space. In addition, they are kicked, punched, whipped and beaten to make them obey. This is not civilised behaviour on our part, as human beings. In addition to this evidence, we have produced a scientific report, called ‘Animals in Circuses: the Science on Suffering’. This new report is a review of the scientific evidence of animal suffering in captivity and during transport. We discuss the biological effects that stress and suffering has on animals when they are captured, or transported. We show that even domesticated species such as horses and farm animals, show signs of stress during transport, with increases in stress hormones in their bodies. The science, and our own observations, tells us that these animals experience mental as well as physical suffering in travelling circuses. This restriction of natural behaviours, and restriction of movement, eventually sends these animals out of their minds – we call it “circus madness”. If an animal has no control over its environment, and cannot move about to exercise its body and mind, this causes it to start to perform repetitive, abnormal behaviours which animal behaviourists call “stereotypical” or “displacement” behaviours – these behaviours are an indicator that the animal’s welfare has been compromised or damaged, and that it is suffering as a result. ADI takes the view that, because of the circumstances of travelling circuses, where cages must be small and mobile, where all accommodation must be temporary, it is simply not possible for travelling circuses to provide their animals with the accommodation they need to keep them healthy.